Would you like your business to contribute to the cultural sector? 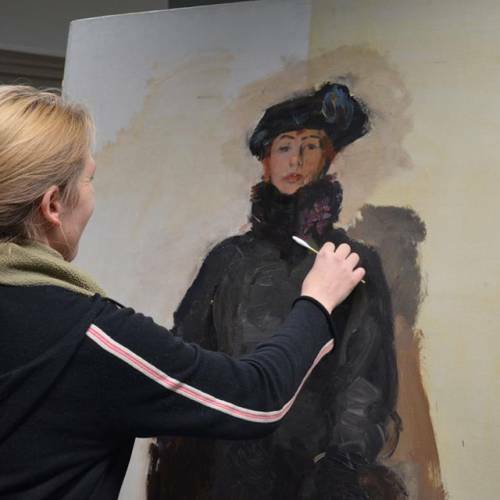 By making a donation, you will be supporting us in creating exhibitions, restoring masterpieces, and designing educational products for primary and secondary school pupils. Helene Kröller-Müller and her husband also called on wealthy private individuals and businesses to realize their dream ‘museum house’. Want to help preserve the museum for future generations? You can become an associate of the museum or become a Boeker (Backer) for the Helene Kröller-Müller Fonds foundation. If you would like to know more about the possibilities, or want to schedule a personalized meeting, please contact our assistant fund manager Daniëlle van Stralen. You can reach her by calling +31 (0)318 591241 or by sending an e-mail to daniellevanstralen@hkmfonds.nl. The foundation has been awarded the status of cultural Algemeen Nut Beogende Instelling (ANBI, public benefit organization). Companies and foundations receive tax benefits when donating to one such Public Benefit Organization. More information on the fiscal benefits of donations can be found on the Belastingdienst (Dutch tax authority) website. Photo: A behind the scenes look at the restoration works on Félix Vallotton’s piece entitled Les filets, Honfleur, 1912. You can read more about the restorations, educational projects, and exhibitions that need your support. please fill in the contact form or call us on +31 (0)318 591 241.